Apostrophe Catastrophes: A Farmers' Market for Farmer's? FilmFather sent me an ad from the Wilmington News Journal that features an apostrophe catastrophe in the headline. 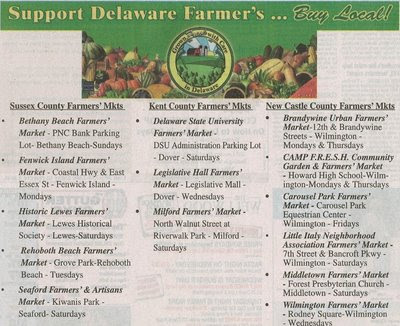 The word farmers in "Support Delaware Farmers" is plural, not possessive, so it shouldn't have an apostrophe in it. But should the phrase farmers market? The answer to that question is not so simple. According to Grammar Girl's discussion on this topic, the AP does not use an apostrophe in farmers market, while the Chicago Manual of Style does. I think that it's trying to say "Support the Delaware Farmer's Ellipsis." I prefer the apostrophe on farmers' market. But then again, I'm also a fan of the serial comma, so I probably can't be trusted. I love the serial comma! It doesn't seem to be a question of WHETHER an apostrophe is used, but WHERE; either "farmer's market" or "farmers' market" would make sense--but "farmers market" simply doesn't. so i would leave it out. What if the market is owned and operated not by one farmer or by several? Instead, it is owned and operated by a community organization FOR the farmers to market their stuff? Then no apostrophe? More than one farmer, so farmers. More than one market so markets. The markets are possessed by the farmers, so farmers' markets. Just my two cents. :) I agree with the post that an apostrophe must be used one way or another - farmer's or farmers'.